Our clients, both keen gardeners, desired compelling connections with their well loved established bush rockery garden, a generous pool area, and the spectacular views surrounding their property. With a simple architectural device, we brought the bush to the house. 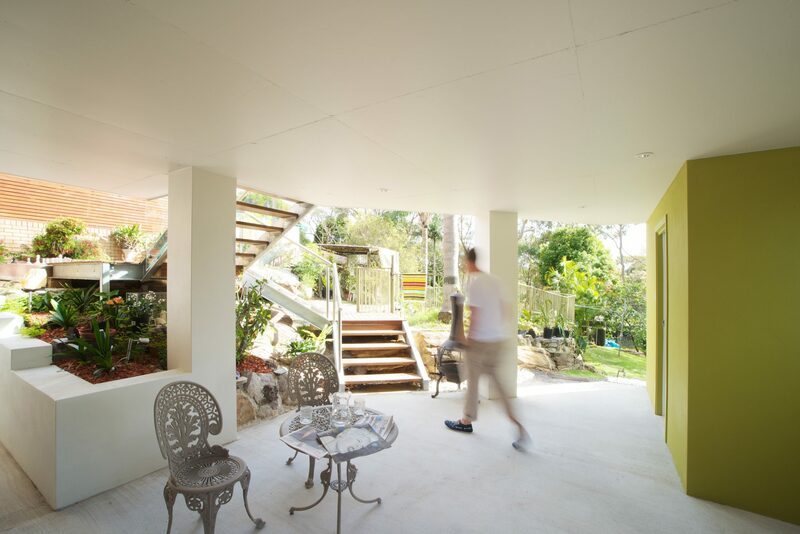 The brief for the Elanora Heights House was deceptively simple - retain the existing dwelling, attach a new external living space and maintain the flow and connections to the garden articulating the rolling site. By addressing the sagging street appeal with a structured, inviting front entrance platform that speaks to the new rear deck addition, our design strategy created legibility and functionality, pulling the house together front and back. Navigation of the garden and pool area from the new deck is made via a folded timber and galvanised steel staircase which leads to a shaded patio area underneath the deck. An enigmatic green box houses the newly constructed external shower room acting as a feature whilst blending into the garden beyond. Refurbishment of the living room and the rear of the house allowed the dwelling to open up to the site opportunities for light and views of the rear garden, which was achieved with large sliding doors and full height louvre windows. The existing deck and carport structure to the rear were both demolished for a large new open deck to be constructed which allows excellent flow from the main internal living area to the outdoors. This new deck sits opposite the existing garden terrace and frames the views over the pool to the bushland vista.